When the 2nd war with Great Britain broke out and General William Hull's immediate surrender of Fort Detroit, General William Henry Harrison began preparing for the expected invasion of northwestern Ohio by the British and supporting Native Americans. At that time, northwestern Ohio was known as the Black Swamp. It was a mucky water logged area that made travel by land extremely difficult, especially on foot. Rather than forcing troops through this ordeal, Harrison decided to build a number of forts and supply depots along the rivers so that these supplies could travel by water. The rivers of the early 1800s were entirely different from what we know today. They were mostly slow moving, deep water rivers that retained their water levels almost year round thanks to the swampy land supplying them with water. Even during hard rains the rivers would remain relatively even since the water had to flow through the swampy land before entering the river. Later, as the land became farm lands, and was drained, the rivers changed character with wild fluctuations in water levels and current strength. Usually the forts were built in defensible positions. Cannons deep in the wilderness of western Ohio were unlikely to be encountered, so the forts only needed to provide protection from scaling the wooden walls and to provide cover from enemy rifle fire. The forts also could accommodate a number of local citizens that might be threatened, but their primary purpose was for supply storage. They were roughly spaced to be about a days travel time between forts. In the fall of 1812, troops from Kentucky under the command of Lt. Col. Robert Pogue, built Fort Amanda along the banks of the Auglaize River. He named the fort after his 12 year old daughter Amanda. At that time the fort was about 160' x 160'. When General Harrison feared an imminent attack from the British in the spring of 1813 he ordered larger quantities of supplies to be stored at the fort. In February 1813, Capt. Daniel Hosbrook assumed command of the fort and began organizing the fort to accommodate the additional supplies arriving. He doubled the original size of the fort to almost 160' x 320'. Livestock, grain, munitions and whiskey could now be safely stored to almost double the original size of the fort so that it was about 160' x 320'. A fifth blockhouse was also added during this remodeling as well as several cabins and storage buildings. Fort Amanda's walls stood about 11 feet tall. Holsbrook also built a number of large rafts that could float supplies down the Auglaize River, north towards the Maumee River. A monument erected at the site in 1915 memorializes the fort. It is in Logan Township, along Highway 198 and Ft. Amanda Road, southwest of Lima, Ohio. The nearby cemetery contains the graves of 75 unidentified soldiers that died at Fort Amanda, either from sickness or from wounds received from battles elsewhere in the state. Fort Stephenson was at the head of navigation on the Sandusky River, on the site of present Fremont. The fort was well constructed and enclosed an acre of ground. Fort Seneca was built as a stockade by a detachment of Gen. Harrison's army. It was used as a supply depot and stood on the west side of Sandusky River about 10 miles south of Fort Stevenson. Fort Ball was built on the west bank of the Sandusky River, in what is now the city of Tiffin. It was a fairly small stockade, enclosing perhaps one-third of an acre, and was used as a supply depot. Fort Defiance first saw service during the Indian Wars of the 1790s. After the Battle of Fallen Timbers, Wayne used the fort as an operational center used to seek out and destroy Native American villages within a 50 mile radius of the fort. After the signing of the Treaty of Green Ville, Native Americans allowed for the fort to be converted into a trading post. With the outbreak of the War of 1812, Harrison repaired the fort so it could again become an active fortification while other forts were constructed nearby. This stockaded position located just east of where the Wyandot County Court House in Upper Sandusky now stands. It was used as a supply depot and was located on a bluff along the western side of the Sandusky River. During the Indian Wars of 1793-1794 General Anthony Wayne ordered construction of Fort Loramie. It was located at the portage between St. Mary's River and modern-day Loramie's Creek. 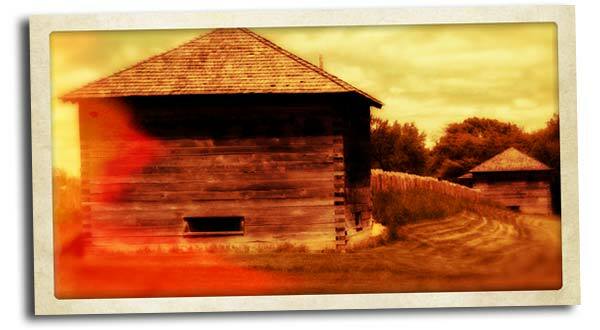 Wayne initially intended Fort Loramie to be an actual stockade, but after defeating a large group of Native Americans at the Battle of Fallen Timbers in August 1794, he decided a blockhouse and several storage buildings were more important. When the War of 1812 erupted, the abandoned fort was once again occupied and defended as a supply depot. After the war the fort became a tavern. Fort Findlay was a stockaded supply base about 50-yards square, with four blockhouses. It was ordered built by General Hull on his way to Fort Detroit where he surrendered his forces to the British. Colonel James Findlay carried out those orders to build the fort and a road from Ft. McArthur on the Scioto River to Blanchard's Fork. After he carried out those orders the fort was named in his honor. Immediately after the war the fort was occupied by some Wyandot Indian families that were common to the area. The village of Findlay was laid out in 1821 along the Blanchard River not far from where the fort stood. Fort Meigs located just south of today's Toledo, along the banks of the Maumee River, was the largest fort constructed in Ohio during the War of 1812. Under extremely adverse conditions, General Harrison urged his men to construct the fort in record setting time. It would become a focal point in the British invasion of northwest Ohio. Also called Vance's Block House was a block house built by a group of independent riflemen organized by Joseph Vance. They organized themselves to protect nearby colonists from Indian and British attack. There was 2 twenty foot buildings connected with a common second story. Vance would later become governor of Ohio. The structure was located about a mile east of Logan.